While bonnets were the most common choice throughout the early Victorian era, a wealthy lady could purchase hats of countless varieties. I don’t intend to cover them all here. Likewise, I think it’s safe to speculate that while in the countryside or travelling abroad, especially wild places, women of the times adopted men’s head wear for practical purposes. Certainly by the mid and late Victorian eras there is photographic proof of this. 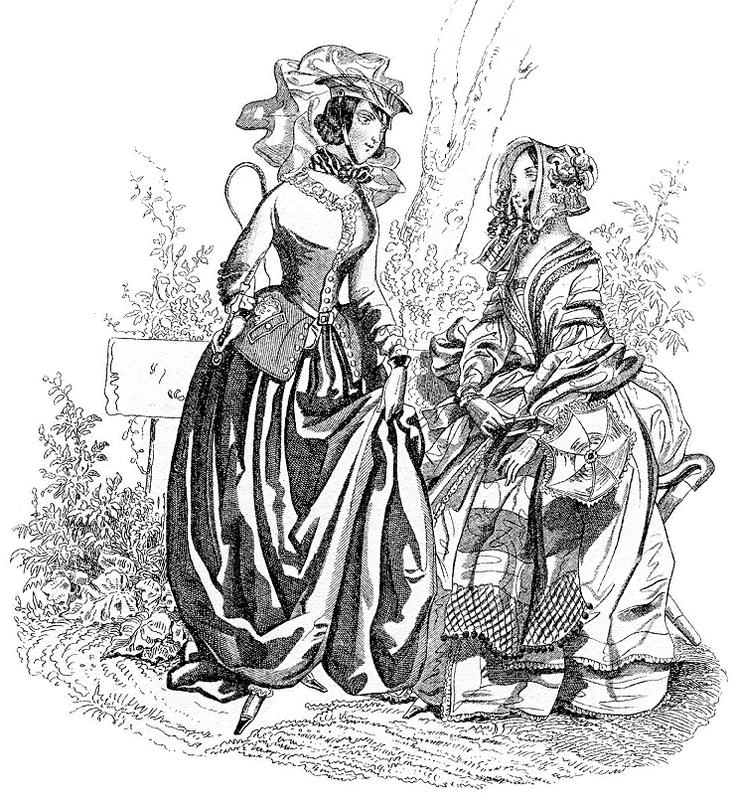 However, most ladies generally wore feminine items, and this article will reflect those tastes. 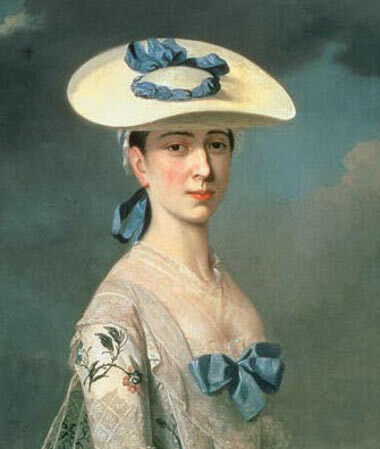 Broad brimmed straw sun hats were very popular in the 1700s, and remained so throughout of the 1800s, ranging from simple to elaborate, rather like bonnets. 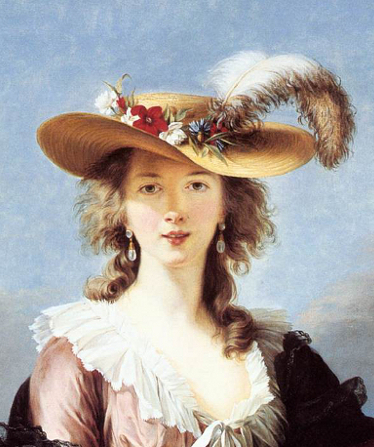 The straw hats were often held on with a ribbon or veil. Hat pins had been used for decades, but were expensive and somewhat heavy. It wasn’t until the 1850s that inexpensive thin hat pins became available for the masses (because of an American machine invented in 1832). This led to women’s head wear becoming something that would just perch on top of their hair, usually worn tilted over the forehead. By the 1880s bonnets had vanished, and little jaunty hats replaced the early and mid Victorian styles. This was true of most types, including straw, which became little boaters, but the broad-brimmed straw sun hats never disappeared and are still favoured today. Known as a “Bergere” (shepherdess in French) it is tied with a ribbon at the back of the head. Nicely decorated with silk flowers and a plume. This hat may just be worn firmly on the head or perhaps held by a pin. The two images above are of portraits done before the early Victorian era, but the styles are accurate for the times. Unfortunately I haven’t found many good quality examples to post here; I’ll keep looking. There were lots of different styles done in straw, the weavers being almost as creative as the felt shapers. 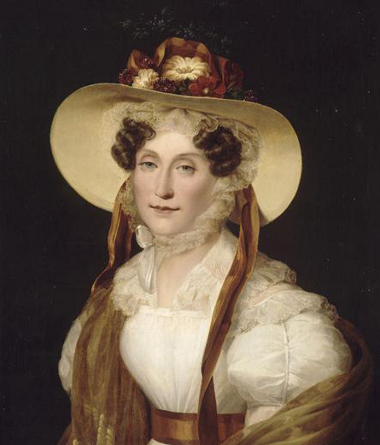 Milliners worked as skilled craftsmen and catered to their customers’ desires. 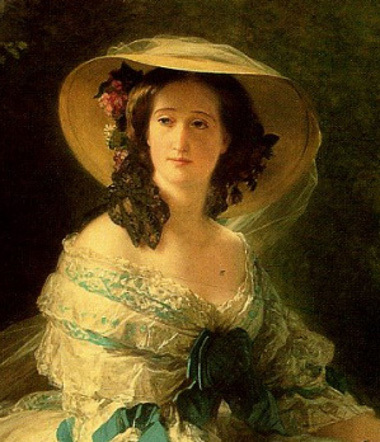 Adelaide d’Orleans by M. Cogniet, 1838. Empress Eugene by F.X. Winterhalter, 1857. The Queen Rides Out, 1838, by Sir Francis Grant, nicely portrays the newly crowned Victoria dressed to inspect her troops, wearing a fantastic hat. 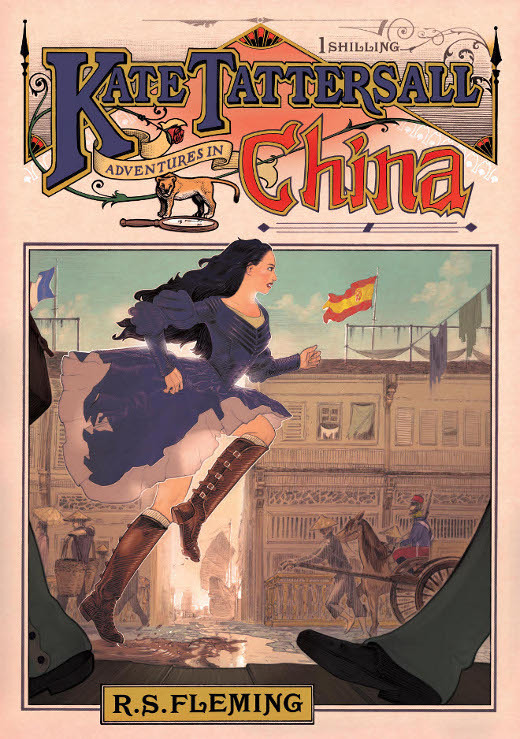 Many women enjoyed travelling by horseback, and did so whenever the opportunity arose, or just as exercise and for sport. Riding outfits (known as habits) generally included a matching headdress. 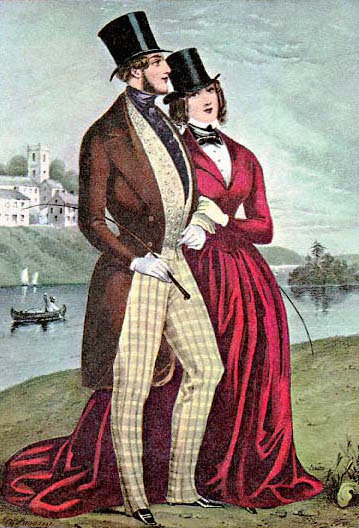 The bonnets up until the second half of the 1850s wouldn’t do for equestrian pastimes because it robbed them of their peripheral vision. The top hat worn by men was adopted by the ladies, generally in the form of a straight cone and small brim. These were of beaver felt early on, but switched to silk. There was also a number of other brimmed head wear to choose from, in many different styles, and it appears the modern fedora may have evolved from these. “Lovers Morning Recreation” a print by Sarony & Major, 1850. The appearance and shine of these hats indicate silk. 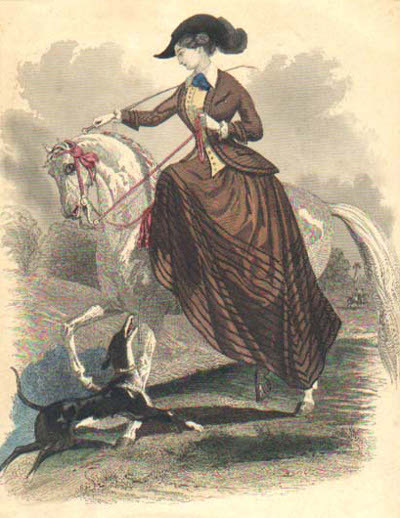 Riding habit fashion plate circa 1847. It appears to be a felt hat with a plume. This lady may have a pin holding her hat on, but perhaps it just has a snug fit. 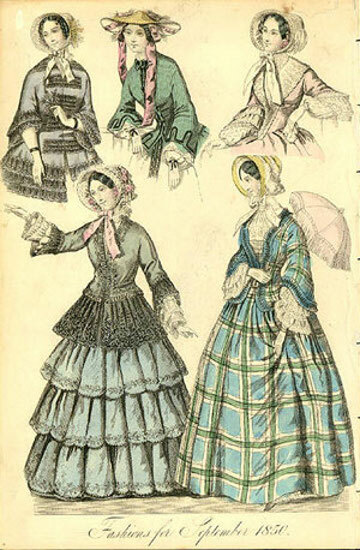 “Fashions for September 1850” stresses bonnets, but there is a straw hat featured top centre. Note the parasol held by the lady on the right. These became increasing popular through the 1850s. 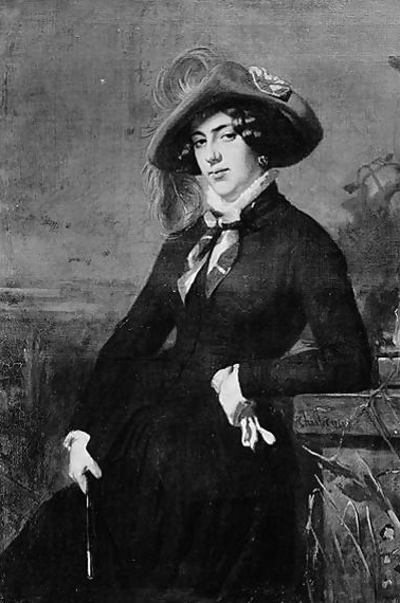 Portrait of Lola Montez in a riding habit by N.T. Charlet, 1844. A dashing cavalier style felt hat with plumes and a rosette. This charming drawing entitled “La Mode” (French for fashion) from 1842 highlights an outfit taking cues from military uniforms. 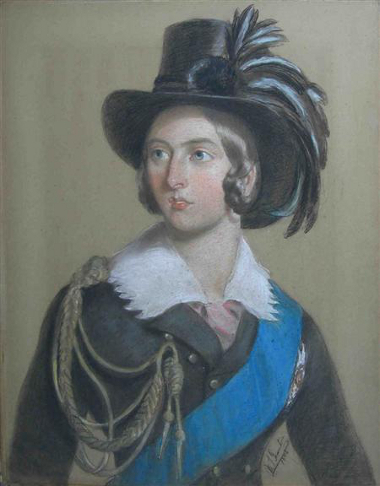 The hat, although cute and feminine with a veil, is very similar to the cavalry caps worn at the time, when the soldiers weren’t wearing their helmets. Known by different names, this type of cap became very popular, worn by soldiers, workmen, students and boys. It exists today in military and police forces around the world. Part 3 will cover some unique headdresses. I recently came across your blog and have been reading along. Please check out my hats by clicking on my name. Maybe Kate would have worn these! I wear straw sunhats like that. Maybe I’ll get some silk flowers for them. Hey, I got some flowers at Michaels and put them on my cowgirl hat. I’ve already had some compliments! I’ll definitely be doing this with my straw hats. I did a search and found hundreds of examples from the past. Maybe this flowery hat look will make a comeback. Thank you for such an informative website. Where would a lady keep so many hats? I guess that’s what dressing rooms were for. Hey, this is more variety of hats than I ever imagined! The peaked riding hats are awesome! I’d like to see those in the period films and dramas. You should consult with directors on this stuff. Also, the look fits in great with steampunk! Cheers!